Shallow Water Ice Management Standby and Support Vessel SWIMSS M/V «TULPAR» Hull No. 268 Delivered 2002 by Ulstein Verft AS For: BUE Marine, UK Designed by: BMT SHIPDESIGN Limited Chartered by: AGIP KCO M/V ”TULPAR” is designed and arranged for a wide range of offshore operations like: Offshore supply duties to production platforms and drilling platforms. Towing of production platforms and drilling platforms, barges etc. Icebreaking in ice (in excess of 0,6 m thick ahead, ice milling of sheet ice up to 1,0 m, and clearing ice rubble many meters deep astern) Fire fighting of external fires. Arranged and equipped according to rescue regulations UKOOA 120-Group B. Systems to contain sewage onboard with zero dumping system. Push bow Low noise and vibration levels throughout the vessel. M/V ”TULPAR” is built with a hotel compliment of high standards and with capacity for 20 crew and 120 rescued persons. Accommodation The vessel is built with a compliment for totally 20 crew with the following room distribution: Two of one-bed state cabins with day room and bedroom Four of one-bed state cabins Seven of two-bed cabins All cabins with separate toilet/shower. Mess and Day room in vicinity of Galley Reception, Restroom (71 persons), Sleeping room (30 persons), Hospital Laundries, Offices, Change room, Toilet/shower room Te c h n i c a l d a t a DECK CRANES One deck service crane, 10 T at 9 m, extending to 3 T at 20 m One provision crane, 1,5 T at 10 m LIQUID CARGO DISCHARGE SYSTEMS One Fuel oil pump, 100 m3/h – 9 bar (plus one spare) One Fresh water pump, 100 m3/h- 9 bar (plus one spare) One Cargo sewage pump, 40 m3/h- 5 bar (plus one spare) One Cargo pump for zero dumping, 50 m3/h- 5 bar (plus one spare) One Mud pump, 75 m3/h – 18 bar One Mud/Brine pump, 75 m3/h – 18 bar Two Ballast pumps, 150 m3/h – 3 bar Mud agitators el. driven (4 off) Flowmeter for FO cargo SIDE THRUSTERS Two Pump jet thrusters forward, each of 850 kW – 1200 rpm Frequency converter drives (12 pulse) MANOEUVERING/POSITIONING Joystick NAVIGATION / COMMUNICATION S-band ARPA radar and X-band TM radar Electronic chart system Radio installation according to GMDSS – area A3 Inmarsat C and Inmarsat B / Mini-M INTERNAL COMMUNICATION Digital automatic telephone system with analogue and digital extension ports PA system with integrated loudhailer. Batteryless telephone system Parabolic TV Satellite antenna DECK MACHINERY Two Combined Windlasses / Mooring Winches, pull 22 T, el. driven Two Tugger Winches, pull 10 T Two Capstans aft, pull 10 T Towing Winch of ”waterfall” design, pull 100 T, two declutchable plain type towing drums, drum capacity: 600 m of 56 mm dia. wire. 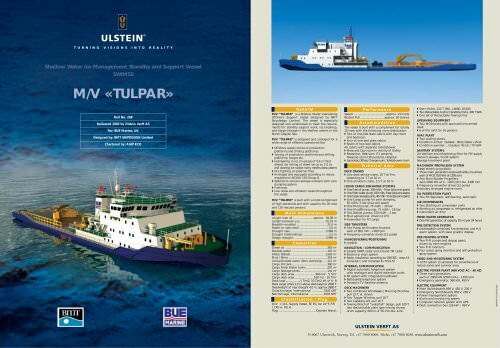 General M/V ”TULPAR” is a Shallow Water Icebreaking Offshore Support Vessel designed by BMT Shipdesign Limited. The vessel is especially designed and constructed to meet the requirements for standby support work, ice breaking, and barge towage in the shallow waters in the North Caspian Sea.